I love one pot meals. I think they have become my most favorite kind of meal to make. This one is so delicious and perfect. 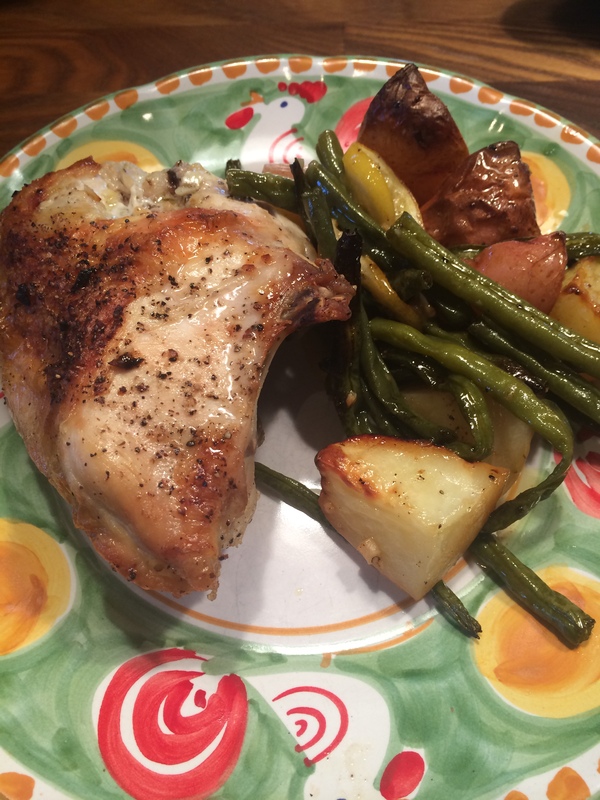 Chicken was cooked perfectly and the lemons caramelized in the pan adding a delicious flavor to the chicken and potatoes and beans. We thoroughly enjoyed this and it is a perfect recipe for all year round. I made it with 2 chicken breasts for the 2 of us, this recipe should serve 4 beautifully according to directions with 4 breasts. You will need a large baking dish or you can make in a cast-iron skillet. The prep is pretty quick and the shopping is easy. Nothing exotic here just good old cooking with easy ingredients. Enjoy! Preheat oven to 450 degrees. I always spray my baking dishes with cooking spray for easy clean-up. 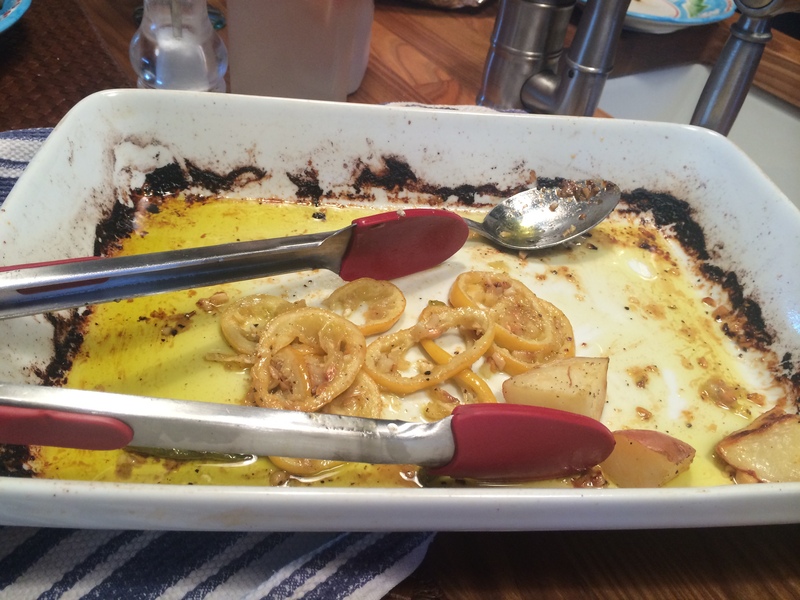 Then coat your baking dish with 1 tablespoon olive oil. Arrange the lemon slices in a single layer in the bottom of the dish. In a large bowl, combine the remaining 5 tablespoons of olive oil, lemon juice, garlic, salt and pepper; add the green beans and toss to coat. 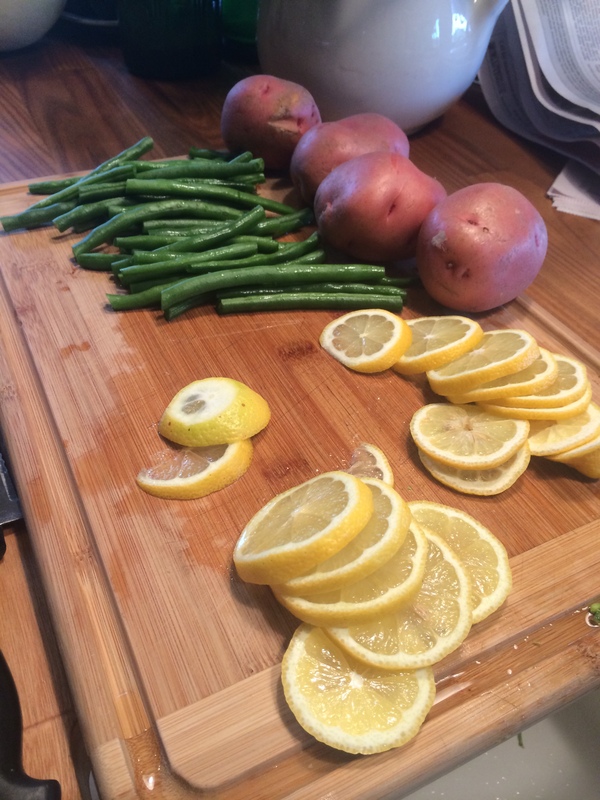 Using a slotted spoon or tongs, remove the green beans and arrange them on top of the lemon slices. Add the potatoes to the same olive-oil mixture and toss to coat. 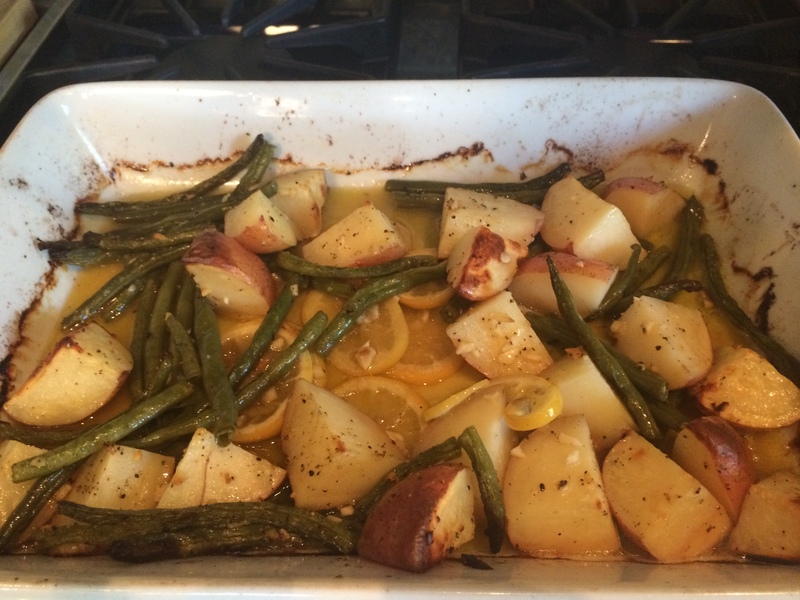 Using tongs or slotted spoon again, arrange the potatoes along the inside edge of the dish or skillet on top of the green beans. Place the chicken in the same bowl and coat with the olive-oil mixture. Place the chicken , skin side up in the dish or skillet. Pour any of the remaining olive-oil mixture over the chicken. Roast for 50 minutes. Remove the chicken from the dish or the skillet. 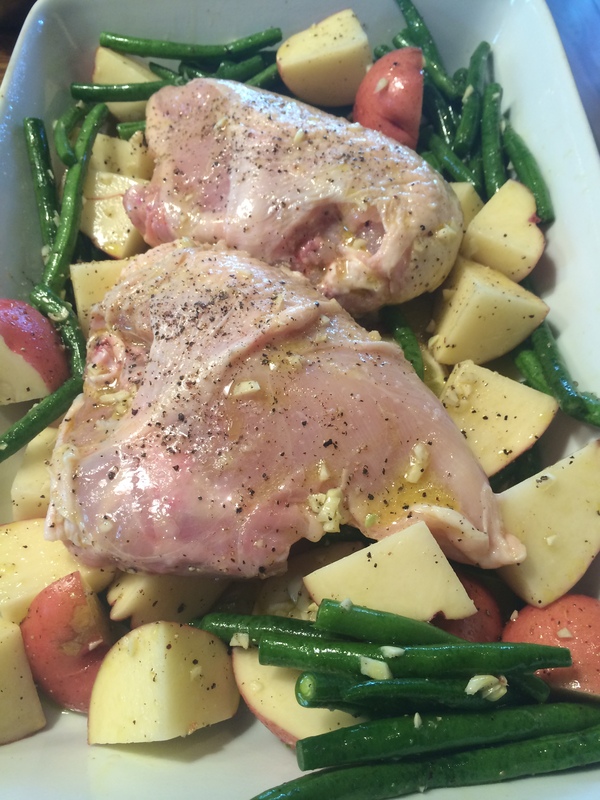 ( you may want to cut into chicken to make sure it’s ready, I roasted for about 55 minutes) then place the beans and potatoes back in oven for about 10 minutes until the potatoes are tender. I covered the chicken with aluminum for that 10 minutes. When potatoes are ready, place a chicken breast on the plate and plate up the beans and potatoes. Serve Warm from the oven. This entry was posted in chicken and tagged chicken in one pot, chicken with beans and potatoes, one pot chicken and vegetables, roasting chicken. Bookmark the permalink. This is one of the best chicken dishes ever!!! Super easy and you will look like a pro. Nothing exotic just chicken and a few easy to obtain ingredients. Beautiful and delicious! Perfection on a plate! Enjoy! !